The term ‘solid-state’ essentially means ‘no moving parts’. Flash memory is a type of Electronically-Erasable Programmable Read-Only Memory (EEPROM). 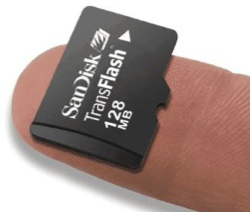 Flash memory is non-volatile (like ROM) but the data stored in it can also be erased or changed (like RAM). You might wonder why, since flash memory is non-volatile, normal computers don’t use it instead of RAM. If they did we would have computers that you could turn off, turn back on again and no data would be lost – it would be great! The reason is speed – saving data to flash memory is very slow compared to saving it to RAM. If a computer were to use flash memory as a replacement for RAM it would run very slowly. However some portable computers are starting to use flash memory (in the form of solid-state ‘discs’ as a replacement for hard-drives. No moving parts mean less to go wrong and longer battery life. Memory sticks (or ‘thumb-drives’) have made many other forms of portable storage almost obsolete (why burn a CD or DVD when you can more easily copy your files onto a memory stick?). Memory sticks are non-volatile, random-access storage devices. Each of these small devices has some flash memory connected to a USB interface. Plug it into your computer and it appears as a drive. You can then add files, erase files, etc. You can use it to move any type of filebetween computers. Flash memory used to be very expensive, but in recent years it has become much cheaper and you can now buy a 16GB memory stick for just a few dollars. Many of our digital devices (cameras, mobile phones, MP3 players, etc.) require compact, non-volatile data storage. Flash memory cards provide this and come in a variety of shapes and sizes. 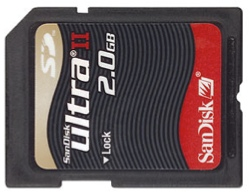 One of the most common formats used by digital cameras is the SD Card. The cards store the digital images taken by the camera. Mobile phones contain a Subscriber Identity Module (SIM) card that contains the phone’s number, the phonebook numbers, text messages, etc. Many phones also have extra memory cards to store music, video, photos, etc. (e.g Tiny Micro-SD cards). Many credit cards (e.g. ‘chip-and-pin’ cards), door entry cards, satellite TV cards, etc. have replaced the very limited storage of the magnetic strip (the dark strip on the back of older cards) with flash memory. This is morereliable and has a much larger storage capacity. 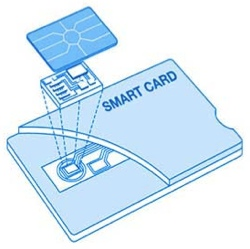 Cards with flash memory are called smart cards.